This weekend brought the first snow of winter to many Americans. For some of you, that was delightful. Maybe you made a snow angel. But others are researching countries where the temperature stays above 50 degrees and wondering whether Earth was a mistake. Both of these are valid viewpoints. Regardless of your position on the above, you'll agree that your slight discomfort was worth the immense joy the panda in this video is experiencing because of that very same snow. Maybe this is bringing about a real shift in your perspective, maybe not. Either way, you'll feel better 20 seconds into this video of a panda rolling down a snowy hill like a little kid, so just do that. This precious, precious video and this precious, precious panda come from the National Zoo in Washington, DC. The video is also accompanied by an interesting overview of how the zoo's animals are cared for once Jack Frost returns. Pandas, you'll learn if you read it, are apparently more active in the cold. That's because pandas are native to the Western Chinese mountains, so the cold is their element, like those teenagers who wear basketball shorts in February. 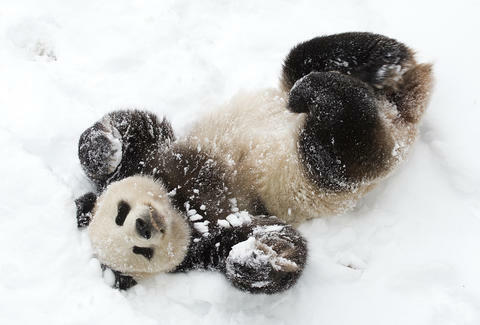 The more you watch the panda, the more you'll like winter, so grab and another blanket and settle in. It's not so bad. James Chrisman is a News Writer at Thrillist who now thinks that maybe life's not so bad after all. Send news tips to news@thrillist.com and follow him on Twitter @james_chrisman2.